FIJI Airways has scooped Auckland Airport’s 2013 Airline of the Year Award. In a statement issued on Friday, NZ busiest international gateway gave Fiji Airways the top prize for the introduction of a new product and improved services. “The Airline of the Year Award recognises the introduction of a new product, service or process innovation; measureable improvements to a current product, service or process; commitment to continuous improvement of business operations; and improving the passenger experience at the airport,” said Judy Nicholl, the airport’s general manager Aeronautical Operations. “The 2013 Airline of the Year Award winner is Fiji Airways. Ms Nicholl lauded the purchase of brand new aircraft and livery. “The airline’s new Airbus A330-220 provides passengers with state-of-the-art features and the aircraft’s branding is authentic, distinctive and articulates the airline’s Pacific heritage. 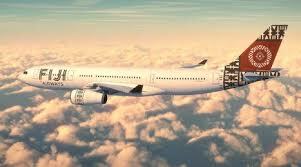 Fiji Airways also won the DesignAir top ten livery award this year.